Brant Hansen is a graduate of the University of Illinois, and formerly worked as a youth minister, before stints on morning shows at WBGL-Champaign, and KSBJ-Houston, and as a talk show host on NewsTalk 1400 WDWS in Champaign. He’s currently host of, “Mornings with Brant”, offered by CHRSN, and based at WAY-FM in West Palm Beach, Florida. 1. How has your morning show evolved or changed over the last few years? I think – I hope -- it’s gotten more and more honest. I gave up trying to be cool many years ago. It didn’t work, mostly because I’m not cool. But it’s an ongoing thing, trying to re-commit to being less concerned what people think of me, and more concerned with what they think of Jesus. This is *really* tough in radio. Another change: A couple years ago, I was doing the show by myself. 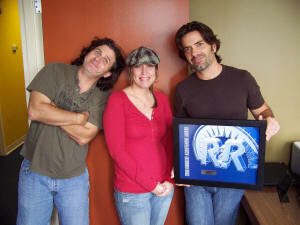 Now, I’ve got people I really love on the show with me – Nikki Lane and Paul “Pablo” Adams. 2. What morning show topics seem to be hot right now? 3. What is the advantage of being syndicated such as your show is now? I get to tell people, “I’m a syndicated radio host.” It’s pretty impressive, until they look down and see I’ve got toilet paper stuck to my shoe. All in all, it actually makes doing the show quite a bit harder, to be honest. It kinda forces us to really focus on that emotional connection with people. 4. What kind of promotions work best for Christian morning shows? This is so lame – I’m sorry – but I actually don’t have much hard data on this. I know what *I* enjoy doing, and what I *think* is working, but it’s hard to tell. I remember that wasn’t a very awesome promotion. I haven’t used one for awhile. Maybe I should. It couldn’t hurt. I feel like – if I’m able to sit and think – there’s enough to observe, think about, and feel in life that I should be able to come up with enough stuff from daily experience. It just seems more organic, for me, if it comes up in conversation that way. People sniff out canned stuff, and it creeps them out. 6. What are the biggest obstacles facing Christian morning radio today? Anyone in Christian radio knows this: Church-folk have been schooled in judgment. As comedic as it can be sometimes, it can really wear on someone who’s trying to be honest, and reflect life as it really is. I hear a lot of people (sometimes, creepily, me) catering to the few, just to avoid the Bible beat-down. 7. Do you think there will be more or less morning syndication in the future of Christian radio? I think that, more than ever, he’s right. The best “local”, for me, isn’t about being in the same town. It’s about sounding like you’re in the seat next to them. Or even part of the family. Local is *a* way to be personal. But “personal” is still the issue. People want relationship. And they’re quite used to not knowing their next-door neighbor, but feeling close to someone in another state. If you connect with Oprah, you don’t turn it off because she’s in Chicago, and you’re not. I don’t get to listen to other morning shows much. I wish I did, because it would probably really help me to listen in to some other shows and learn. It’s not a morning show, but I love that Wally on TotalAxxess on our network. I think he’s innovative, and I love that he pours himself into his job. He knows how important this is. I don’t know. BUT – and I’m just guessing, here – it’s going to be more about personality and connection than ever. And choice. By “choice”: I suspect people will want to hit a button for talk and relationship, then hit another button to hear a particular song, as opposed to waiting through stuff they don’t want to get to what they do want. I think friendship counts more than ever. I admit I’m kind of socially awkward, but I also know I’ve got to spend a tremendous amount of effort responding to emails and Facebook stuff and texts. Long-term, I feel like I’m either going to be friends with the listener, or I’m just some music guy who, like a broken iPod, doesn’t always play exactly what she wants hear. I don’t think she’ll stand for that very long. Now’s the time for honest connection.